This post is by current #citylis student Vashti Turner. This week’s DITA session saw students explore a range of technologies during a workshop run by #makercart. This cart can be transported easily to create a pop-up Makerspace – a place to ‘gather to create, invent, and learn.’ In small groups we circulated through 5 different stations and tinkered with different technologies. Carlos Izsak (@Carlitosi71) demonstrated the use of the 3D printer, downloading an advent calendar pattern from the internet. It is interesting that patterns for 3D printers are shared and adapted like knitting or embroidery patterns. The idea of collaborative creation continues with the growth of the 3D printer, but the 3D printer can also create prosthetic limbs – it is an amazing piece of technology. Next we moved onto a collection of books, magazines and pamphlets about Makerspaces and FabLabs. This was interesting for me to finally read about what Raspberry Pi after having heard it mentioned by a colleague a couple of times. Our group then moved on to the banana keyboard challenge. We followed the simple instructions for hooking up an electric circuit to my laptop and some bananas. Using the website at Makey Makey, each banana corresponded to a note on the keyboard. Eoin (who, unlike me, can actually play the piano!) managed a pretty impressive rendition of Jingle Bells on the banana keyboard. 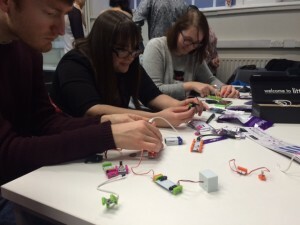 The next station was set up with Little Bits – DIY electronic building blocks. We created a number of different circuits, including a clap lamp, christmas lights and an intercom. The final station allowed us to watch a demonstration of the paper cutter creating part of a pop-up card. Much like the 3D printer it works from a digital pattern. After the workshop part of the session we sat down to discuss library makerspaces in the context of library closures and budget cuts, and how we can lower the entry barriers to make them cheaper and more accessible. This was an interesting topic; the idea of access to technology and tools to create being open access is, I think, fairly important. There should not be an economic barrier to creativity. The idea of open access to tools for creativity is an important ethos at my workplace. As an entrepreneurial school, we believe strongly in the words of our lead sponsor Sir Rod Aldridge, who said ‘It’s not where you come from in life, but where you get to that counts.’ The school hosts an entrepreneurial hub called Kensington Creates in the atrium below the school library. This is essentially a makerspace hosted by the school for young entrepreneurs from the local community. The new business owners rent a pod and have access to the school’s laser cutter and kiln room, in return for running after school ‘Creates Clubs’ with the students. Rather than just one workshop filled with technology to help create, the Kensington Creates entrepreneurs can use the whole school as a makerspace. The scheme encourages creativity and inspires the students – but it also provides open access to young business owners so that they can use technology not otherwise affordable. I am looking forward to reading more about makerspaces and visiting some as soon as possible! Vashti Turner is on Twitter @book_turner. This post was originally published in a slightly different form by #citylis student Vashti Turner on 6 November 2015 on the #citylis DITA 2015 class blog. Find out more about postgraduate study in Library and Information Science at #citylis, meet alumni, current students and staff on our next open evening on Wednesday 17 February 2016. Register here. Student Perspectives is our series of guest posts written by current #citylis students. 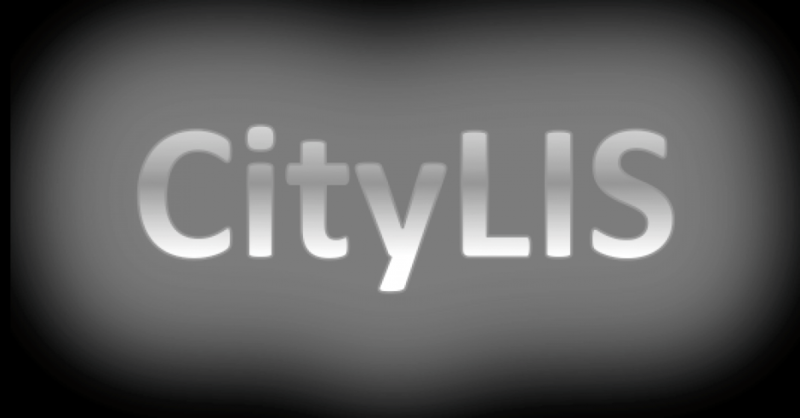 If you are a current #citylis student or alumni and would like to contribute a post, please contact Dr Ernesto Priego. This entry was posted in Student Perspectives and tagged #inm34815, #makercart, Anglia Ruskin University, Carlos Izsak, CityLIS, DITA, Kensington Creates, makerspaces, making, Student Perspectives, students. Bookmark the permalink.